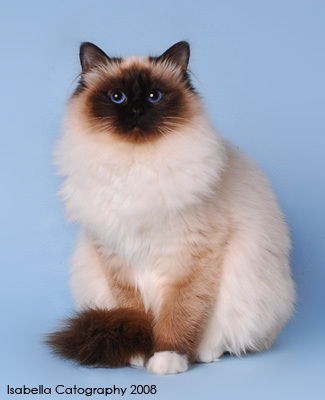 Damukyan is a Boutique Birman Cattery, breeding conservatively and exclusively for quality kittens. The cattery is situated in the leafy suburb of Wahroonga, on the upper North Shore. I began breeding in 1970 with Burmese and Persian cats. I purchased my first Birman in 1986. All Damukyan kittens are born inside the house so that they may be exposed to all the sounds of a home environment. The kittens are never born or housed in the outside cattery. When weaned, kittens are fed Iams Kitten food. I have been feeding my cattery on Iams/Eukanuba product for many years and I am a member of the breeders club. An information sheet is given to all adoptee parents. Kittens leave Damukyan between 11-12 weeks of age having been regularly wormed, fully Veterinary checked, and Microchipped along with their 1st Vaccination. Damukyan is a closed cattery, my studs are not available for stud services. Please contact Brenda on 9489 3872 or via email *brenda@damukyanbirmans.com* for any further information. Web design and photography by www.isabellacatography.com. It is illegal to copy photos and graphics without permission from the copyright holder.